Berlin has many impressive attractions, but within a short distance of Berlin there are a wealth of places of interest worthy visiting. Whether you are looking for historical landmarks and buildings or beautifully landscaped gardens, you can be sure that you won't have far to travel. 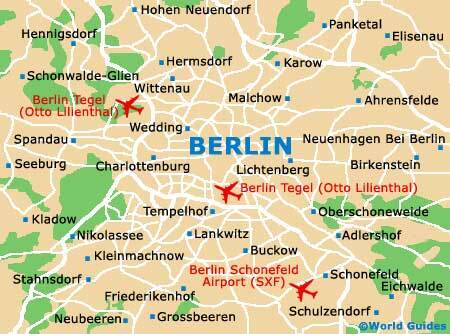 In particular, there is much to see and do in nearby Brandenburg, which completely encompasses Berlin. 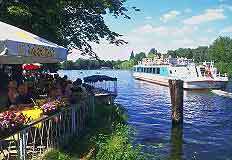 Situated about 12 miles / 20 km from the city centre, this is one of the best trips from Berlin and nearby Potsdam has a great shopping area, Dutch Quarter and many nearby landmarks to visit. This is a part of Berlin that was home to some of the most wealthy people in the whole area during the 17th and 18th century and many wonderful palaces remain as a memory of this past. Attractions in Potsdam worth seeing include the gardens of Sanssouci, Schloss Cecilienhof and also the Babelsberg Film Studios. Also in Potsdam is Wilhelm II's mock-Tudor mansion, made famous in 1945 when it was used by the allies to determine the destiny of Germany, after they were defeated in the second world war. The area is easy to reach by train and is well worth a visit. You should allow at least half a day for this trip. Situated in a picturesque setting in the Berlin Riviera, next to a large lake, the Wannsee Conference House is actually the building where prominent Nazis planned the deaths of thousands of Jews. There is now an exhibition at the house and this can be easily found by S-Bahn to Bahnhof Wannsee, and then by bus. You should allow about half a day for this trip. Located some 68 miles / 110 km south-east of Berlin, the Spree forest is vast and this nature reserve is spread over some 120,000 acres / 48,000 hectares. This densely forested land has more than 620 miles / 1,000 km of waterways and this is where the main part of the River Spree flows, before running into Berlin and then the sea. There are plenty of opportunities for walking and cycling in the forest - even some watersports, including boat tours. The harbour at Lübbenau, or the smaller harbours at Lübben or Burg, provide the best starting points for your excursion. There are regular trains that depart from Königs Wusterhausen in south-east Berlin (40 minutes), Bahnhof Zoo (1.5 hours) and Ostbahnhof (1 hour). Located on the outskirts of East Berlin, this is actually the old German Democratic Republic's headquarters of the secret police force - the Stasi. With an enormous network of staff and part-time informers, well over a million, the Stasi had great success in infiltrating East Berlin and today you can visit this interesting building and see where this atmosphere of fear and mistrust was controlled. Located to the south-west of Berlin, Kreuzberg is a lively, unique area which has much to offer. Over the years many Turkish immigrants have settled here and the result is some super Turkish cafés, markets, bookshops and art. One of the most interesting features is a large bronze punk statue which stands on a street corner, sneering at middle Berlin. Allow a whole day for this visit.